Our country is rich in thought, in its philosophy, in its culture. But somehow, we have not been able to project these outside or even to all of our own people perhaps because so many of us look at these matters rather superficially. But Swami Vivekananda and Swami Ranganathananda have been notable exceptions to this. Swami Ranganathanandaji was a noble soul who immersed himself into the mission of spreading the message of Vedanta to humanity spread throughout this planet. The Swamiji was of indomitable spirit and a great spiritual leader. One of the greatest teachers of our times, Swami Ranganathananda was a scholar, a sage, a companion of the needy, and above all a deeply religious person and a true humanist in the best traditions of our ancient culture and civilization. 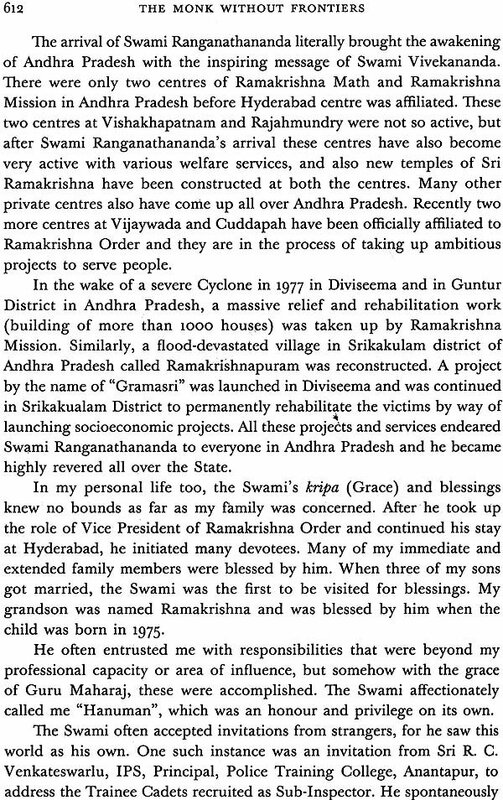 Swami Ranganathananda was one of the brightest spiritual lights that shone upon Indian society in our times. 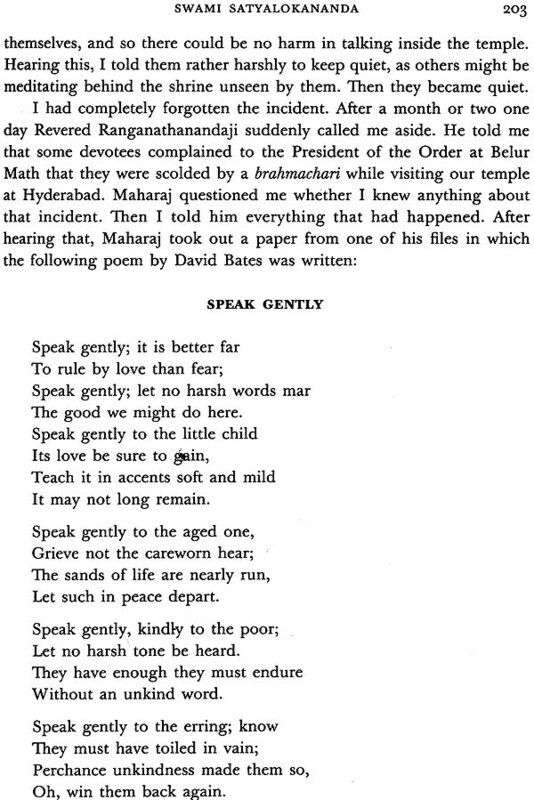 He was an evolved soul, a seeker who began his life by working as a cook and dishwasher in the Ramakrishna Math, and rising to become one of the most revered propagators, both in India and abroad, of the teachings of Ramakrishna and Vivekananda... His was a lifelong mission to tell the world that the myriad problems and challenges confronting it can be addressed only through a radical spiritual reorientation to human affairs. 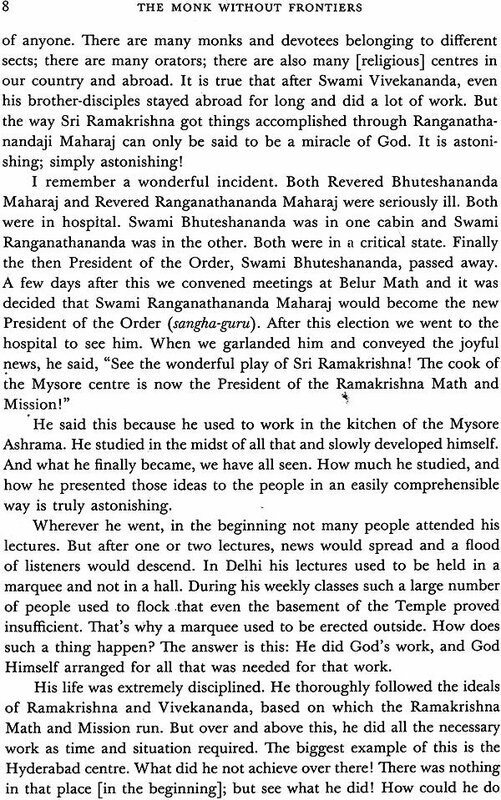 This is a complication of articles written by the monks of the Ramakrishna Order, nuns of the Sarada Math and Ramakrishna Sarada Mission, and devotees and admirers of Swami Ranganathananda. 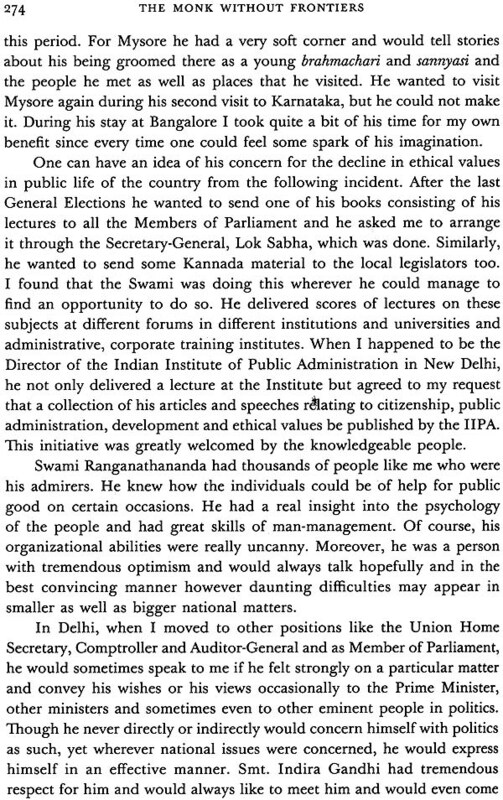 These are 134 pieces of writing on the Swami presenting his multi-faceted personality in an inspiring as well as interesting manner. The Swami in his long monastic career about eight decades had contributed in diverse field, of which the most significant and notable one, for which he was reputed all over the world, was his contribution as the cultural and spiritual ambassador of India to the world. Through the articles of this book it is interesting to note that people viewed him diversely through their diverse frames of mind. A very colorful picture of the Swami thus emerges out of its pages. It is a valuable tribute to the great Swami and his astounding contributions in the realms of spirituality, philosophy, religion, culture and global integration. The life of a great spiritual personality is like the tip of an iceberg, the bottom of which is too deep to plumb. The only difference between the two is that while the iceberg destroys the ship when the latter collides with the hidden rock, the benign spiritual rock of the holy person touches a person tenderly. It is often done without the knowledge of the blessed soul, and the person who is thus touched, is gradually transformed and transported to a blissful! shore. 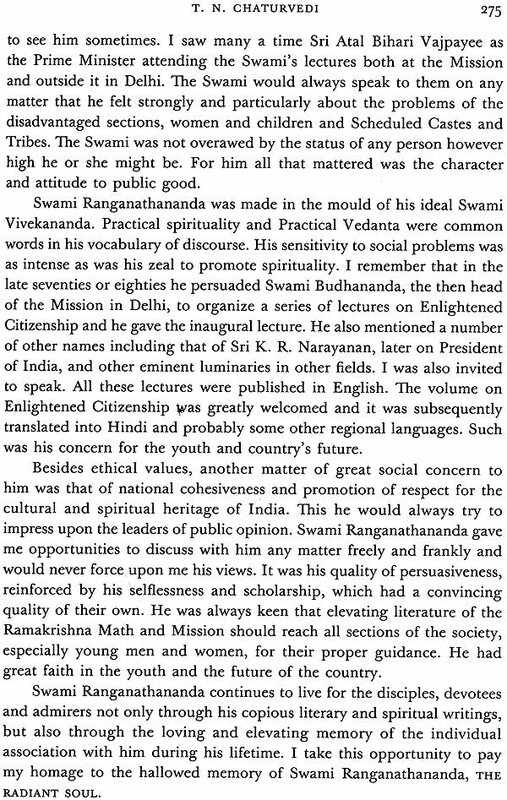 Swami Ranganathananda was one such robust cliff of the lofty spiritual mountain range called the Ramakrishna-Vivekananda Movement which has inspired, strengthened, and guided the lives of innumerable seekers of truth and provided succour and solace to suffering humanity across the globe. Like a true Vedantist monk he made himself accessible to all, irrespective of caste, creed, status and religion. 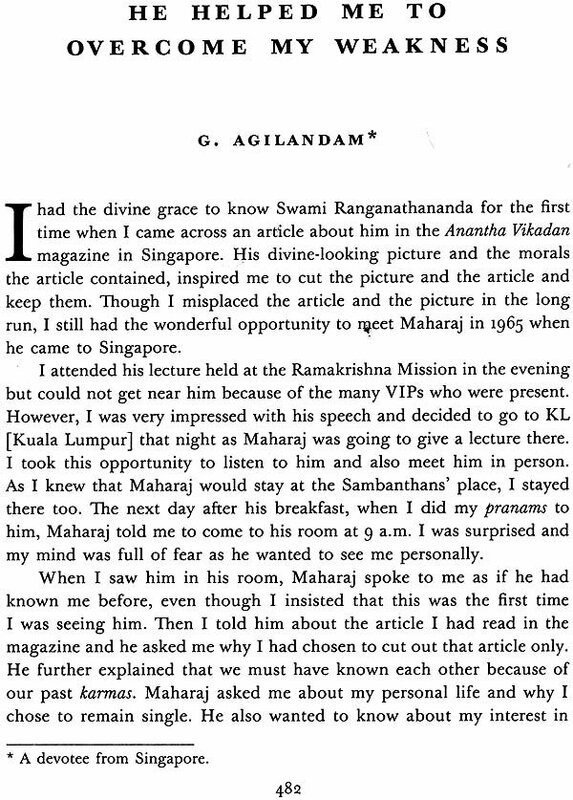 As such Swami Ranganathananda Maharaj was undoubtedly a global personality, a monk without frontiers. 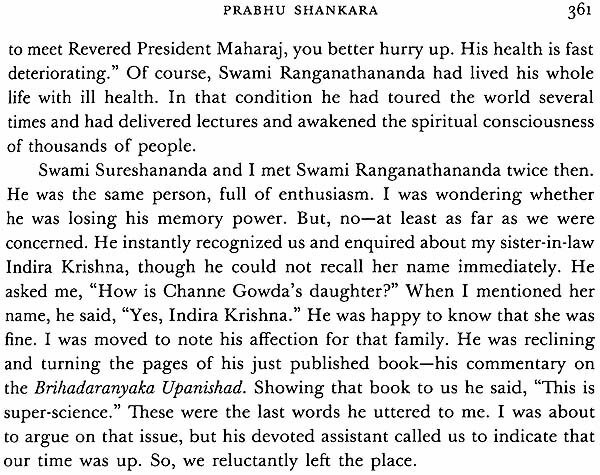 However, he was deeply rooted at the same time in the RamakrishnaVivekananda tradition. In his introduction to Raja-Yoga, Swami Vivekananda declares that “Each soul is potentially divine. The goal is to manifest this Divinity within by controlling nature external and internal.” Swami Ranganathananda, the 13th President of the Ramakrishna Math and Ramakrishna Mission, responded to this clarion call of Swamiji and attained extraordinary heights through self effort and hard work. 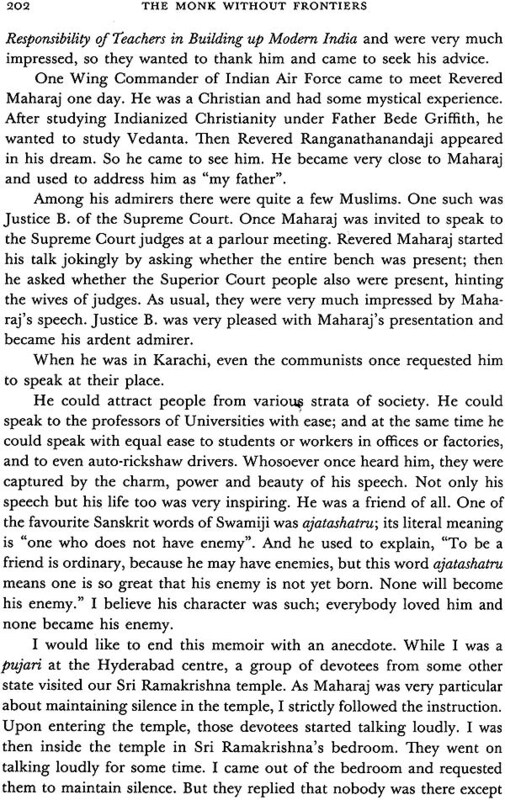 Eventually he manifested his divinity to such an extent that everyone, be it a monk, a householder, a politician or an intellectual, stood as much dazzled and enthralled by his range of knowledge and power of oratory as by his strength of character that radiated human excellence or divinity. 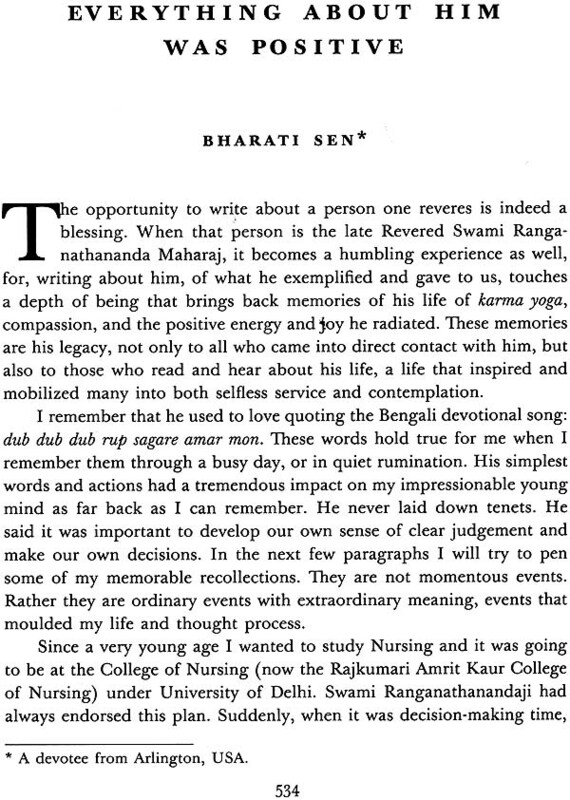 This centenary volume contains 134 pieces of writing out of which 4 are tributes and 130 are reminiscences of Swami Ranganathananda written by monks, nuns, devotees and admirers who are scattered across the globe. They are some of the very important persons who observed him from close quarters for varying periods of time. Some of these reminiscences are quite lengthy and some sketchy. Some are descriptive, some reflective, some analytical, while some contain just a few funny personal anecdotes. But all of them bring to light some nuggets of valuable information about the many-splendoured personality of the Swami. In such a compilation repetitions are unavoidable for obvious reasons. We have tried nevertheless to reduce them to the minimum. 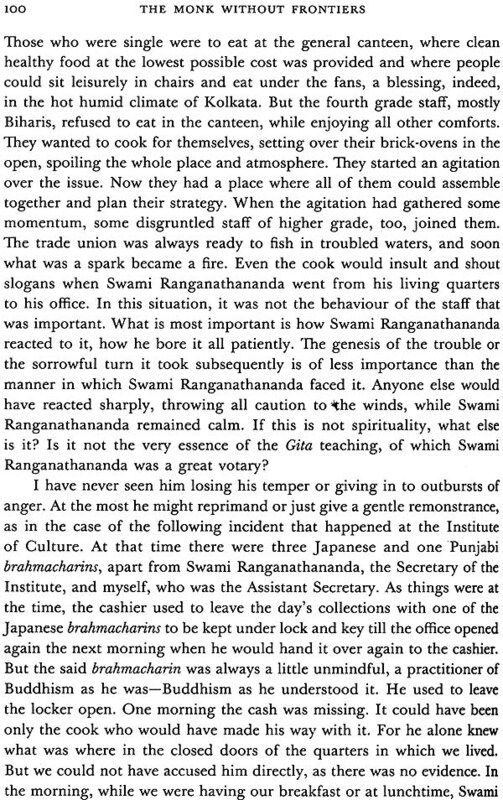 It is of course true that repetition is often helpful as it impresses our mind about the values and ideals that a person of the stature of Swami Ranganathananda embodies. The editor would like to take this opportunity to thank all those who have contributed to this memorial volume and helped this project in one way or another. I thank specially Dr. Shyamali Chowdhury without whose determined effort and enthusiasm this volume would not have seen the light of day. 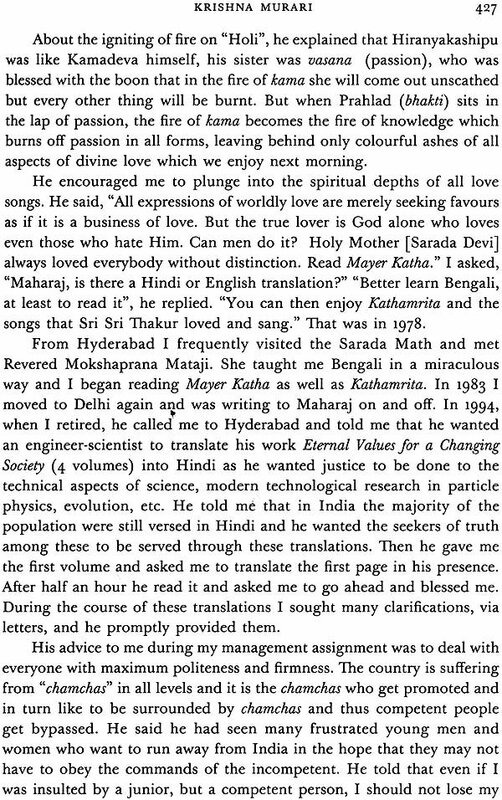 Finally, in spite of all our limitations and shortcomings, if this volume inspires seekers, even a little, to take a leaf out of the Swami’s book of life and character, that would be the most signal contribution that it could make to world culture and global spiritual health! May Sri Ramakrishna, Holy Mother, Sri Swamiji and Srimat Swami Ranganathananda Maharaj bless us all and help us to transcend the narrow frontiers of mundane life in order to realize the oneness of existence.